Mansura (Arabic: منصورہ‎) was the historic capital of the Arab empire in Sindh. The city now lies in Western Pakistan and is usually known as Brahmanabad in Sanghar Sindh, situated about 8 miles (13 km) south-east of Shahdadpur, Sanghar District, and 43 miles (69 km) north-east of Hyderabad. In the Chachnama we find frequent mention of a chief Agham Lohana who was ruler of Brahmanabad with their two terretorie lakha to the west of Lohana and Sama to the south of Lohana (Nerron) Narayankot Hyderabad, Sindh in the time of Chach 636 AD. The city was the first in the Muslim world constructed by using the principles of town planning later used throughout Muslim territory including in the construction of Baghdad 17 years after the city's foundation. Constructed by Khalid ibn Barmak, a Muslim architecture of the Umayyad Caliphate who was a descendent of Persian Bimikin family. Umer Bin Abdul Aziz, who belonged to Banu Habar tribe, the clan of Banu Asad was the first governor for the Al Mansura state in Sindh. 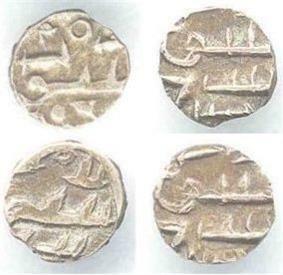 The Umayyad Caliph Mansoor was who had moved to Balkh in present day Afghanistan. 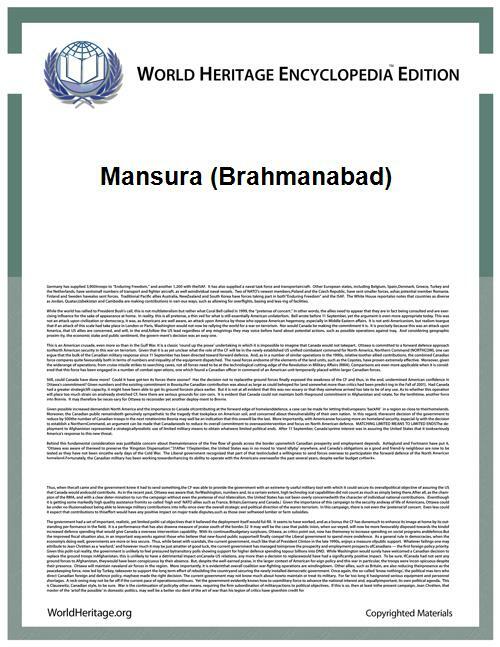 Mansura was originally called Brahmanabad after its Brahmin founder. The Barmakids wielded great influence with the Arabs. Under the Caliphate of Al-Mansur, Khalid was appointed governor of Fars and, after helping obtain Prince 'Isa ibn Musa's renunciation of his succession to the caliphate in 765, became governor of Tabaristan. Around the same time, his son Yahya ibn Khalid, was appointed governor of Azerbaijan. Mansura's history began under the Umayyad Caliphs when Muslim Arabs attempted to conquer the frontier kingdoms of India, Kabul, Zabul, and Sindh. In the early 8th Century, with the Kingdom of Sindh convulsed by internal strife, the Arabs seized their chance and renewed their attacks. Thereafter it was captured by Muhammad bin Qasim, nephew of Al-Hajjaj ibn Yusuf (661–714), the governor of Iraq and Khurasan. Qasim's successors attempted to expand from Sindh into the Punjab and other regions. Al-Masudi have also described foundation of the city to Governor Mansur bin Jamhur, the last Umayyad Governor of Sindh. The city holds an important position in Muslim history as the first to be built by Arabs according to the principles of town-planning. Seventeen years later, lessons learned in Mansura were applied in Baghdad where there were once numerous Sindhi inspired buildings and monuments. According to historians, Brahmanabad was a beautiful town with vast orchards of mangoes and groves of date palms. Today the ruins of Brahmanabad are spread over an area 4 miles (6.4 km) in circumference near the modern city of Shahdadpur. The most significant ruin found in Mansura is the large courtyard of a Jamia Masjid (mosque), while the remains of temples destroyed by the Muslims were re-used to build mosques, leaving no remains other than a small temple structure called a deri (or deval) in Indian languages, which may have been related to the practice of sati. The city lies upon the open sandy plain amongst rolling heaps of brick debris, criss-crossed with the depressions of its original streets and surrounded by the ruins of its once massive walls and bastions. Shaped like a boot with the sole facing north-west and the leg stretching south-east, the whole area has a circumference of 5.75 miles (9.25 km). Apart from a considerable area towards the south-east end, the whole space is covered with billowing mounds of brick ruins. Nothing now stands above the surface, except in one place, where an unrecognizable tower-like core of brick masonry remains. There is a total absence of stone masonry of any kind, but lumps of charred wood dotted here and there indicate the former presence of woodwork. The cement used in the brickwork appears to have been mud which forms the greater mass of the present mounds.